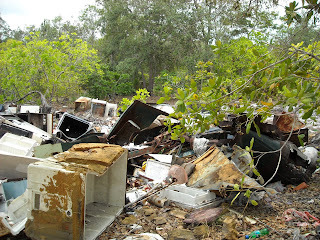 Crooked Tree Village, like many small islands on our planet is suffering from a garbage disposal problem. For some time now, I have been monitoring with much interest, the garbage situation in Crooked Tree Village. The village is swimming in excess refuse; some of it, the burning of hundreds of empty plastic bottles, could be harmful to children and the elderly and there is no appropriate management in sight. The village does not have a single communal garbage dump. Trash is literally everywhere. Some of the villagers have created their own dump in their yards by digging deep holes to burn garbage. 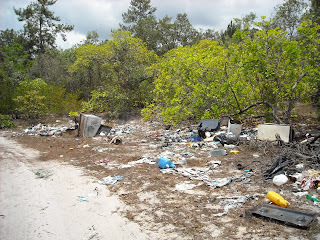 Others just simply throw their trash in their yards or would sneak at night in the under populated areas of the island and dump their trash at the side of the back roads. It is not a pretty sight to see, from refrigerators to stoves, microwaves, beds, hundreds of plastic bags and bottles and even dangerous chemicals. Some of these refuse could take years to decompose or rot. Our world is one big village and mankind its citizens. The people in Crooked Tree Village deserve to live in dignity. The problem of garbage can be solved with several approaches involving the villagers, the local government (Village Council) and environmental education. One of the first things we can do is not to create excessive waste. Improving and educating our young children and youth about recycling and proper disposal of waste is another. Encouraging people to reduce, re-use, recycle and to start composting food for fertilizer is another great idea. An activity on Earth Day teaching school children proper practices is an excellent program that can easily be developed. And lastly, the Village Council should start posting signs, warning and imposing fines, in order to discourage people from dumping garbage on public roads. 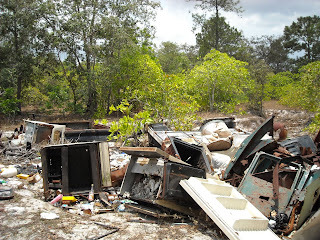 Crooked Tree Village needs a garbage collection program run by the local government, or better yet, the Belize Tourism Industry Association, since the entire island is a government protected sanctuary. Within a few years, if nothing is done, we will not only swim in garbage, but we will be sleeping on garbage too. We cannot only depend on politicians; they tend to put economic reasons before our health and our environment. Education is the only way and it is a gradual process that can be successful, but will take years of awareness training. We should start now and keep working at it. We have to teach our children to see waste as a resource and not a problem. For example, all the beers in glass bottles that are consumed at sporting events have a $0.25 deposit fee. Instead of being scattered or dumped in back roads, they should be collected at a designated site and be returned for the deposited fees. The people of Crooked Tree Village are living on a small island, they need to work together to find a solution to the serious garbage problems that they are facing. I would like to hear from villagers and concerned Belizeans on the management of excessive garbage in Crooked Tree Village. 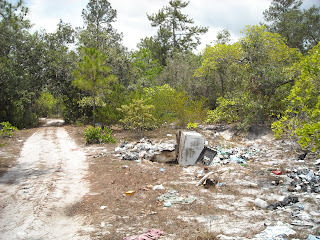 The Audubon Society had donated and installed garbage drums in several areas of the village: at Gloria Tillett's gate, at the bus stop by Ms.Alma Smith, at the road junction with the Northern Hwy, by the Crooked Tree Clinic, one by the school yard entrance, and one was by the "Welcome to Crooked Tree" sign. They had the right idea, but when the drums were filled there wasn't a way to dispose of the refuse. Rob, my husband, and I were saying that we would like to do a book for children in relation to environmental education in Crooked Tree. Rob is an excellent artist. He is BRILLANT. But, we would need help with writing, with the story. This book, with coloring pages, could be given to our children in Crooked Tree's primary school. Ofcourse, we would need funding. But, I am sure we would raise funds to print and publish. Thanks again, this is an excellent idea. We are in the process of forming a recycling program with the school children. I think that it is our duty to educate the children of this world. They are our future!! truly fine material іn favor of reаders.